If you’ve been reading Aliventures for a while, you might have heard me mention Writers’ Huddle before. It’s my teaching / community site for writers, and the doors are open for new members to join this week. Writers’ Huddle is similar to the Aliventures blog … but it goes much further. Instead of blog posts, I produce mini-courses (text and video), monthly seminars, and other in-depth teaching content … I’ve even included my two full ecourses, On Track and Blog On. Instead of guest posts, we have guest speakers on some of the seminars, who share their knowledge and expertise on specialised topics like email marketing and writing articles for magazines (both upcoming seminars). And instead of comments, you get access to forums where you can have extended conversations with other writers about any aspect of writing (or blogging, publishing, etc). The people in this community are warm and friendly and supportive. It’s a safe place to share your work and get feedback. And they are not afraid to tell you what they think, honestly and constructively. I value that. Ali Luke is endlessly inventive and has an uncanny way of targeting and providing the very information we all need in order to improve our writing skills. I highly recommend this community. 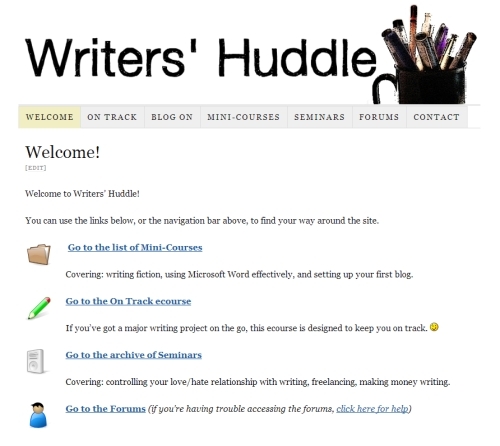 As a Writers’ Huddle member, you pay a low monthly fee – $19.99 – for full access to all the resources on the site. That includes the full archive of past seminars (ten so far, and growing each month) as well as four mini-courses, two full ecourses, an exclusive ebook, and more. You have your own login name and password for the site, and you can access it from anywhere with an internet connection. You can download almost all the resources to your own computer, too — for instance, you can save the audio seminar files onto your MP3 player or phone to listen to at your convenience. I remember getting the notification that Ali had started the Huddle and instantly thinking: if there ever was a place to connect with other writers and learn how this online niche works, this is it! And I was right. I’ve learned so much here from other members – and of course from Ali – as we all have different backgrounds and experiences with writing. If you think it might be for you, do take a look today. This is the last time I’ll be opening Writers’ Huddle for new members until (at the earliest) next May, so now’s your chance to join a fabulous community of writers and get full access to all my very best teaching content. I hope to see you in the Huddle!